Pictured here is the rugged mustache of Dan Gilman, Champion Pedestrian. 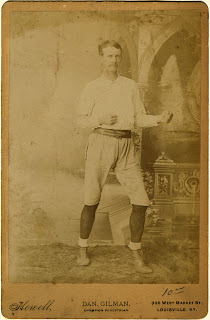 How some men walk at all without a mustache is a mystery, and surely none could be a champion without one at all. The mustache on display here (or moustaches, for they surely would have been referred to in the plural) is laterally streamlined to reduce the champion's air resistance as he sidles. Sidling is a walking gait invented by Victorians to negotiate narrow alleyways and, more important, to stop their moustaches from being besmirched by the various foulnesses of the alley walls, to wit: bird lime, human water, soot, absinthe, urchin tears, gin, mercury, and lunatic drool.